Hamilton: An American Musical is the brand new show all about the life of Founding Father Alexander Hamilton, and are people going crazy for it! In the last year alone, the Broadway production has received a whopping 16 Tony nominations, of which it won 11 including Best Musical, breaking several records along the way, smashing box office sales and received enthusiastically by audiences and critics alike. Our Chigago production has been running since October 16, with a U.S national tour scheduled to begin performances in March 2017. Catch it while it's here and see what the fuss is all about for yourself! Inspired by the 2004 biography “Alexander Hamilton,” by the historian Ron Chernow, Hamilton is the creation of Lin-Manuel Miranda, who upon reading a copy, started to imagine the narrative as a musical, a brave idea from the onset. Following this thought and some research on the subject (a play had already been created on the subject for Broadway in 1917) he began a project called “The Hamilton Mixtape,” the songs of which would later become fully-fledged songs from the show. 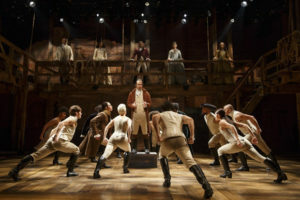 Hype around the show is high – Lin-Manuel Mirana has envisioned a retelling of American History that has never before been seen in history textbooks, with a multicultural and multiracial cast nodding towards the forward-facing nature of the musical. It's already one of the most popular Broadway productions of all time, yet incredibly, most people have never seen it, as there are no recorded versions of it available and you can only see it here or in New York! The reason..? Because they've listened to the original cast recording. Yes, the music alone has been enough to thrill fans across the US and overseas! So don't delay – buy your tickets to see Lin-Manuel Miranda's daring masterpiece TODAY! !